ViRob is a microrobot developed by researchers from Medical Robotics Laboratory at the Israel Institute of Technology (Technion). Just one millimeter in diameter, it can crawl through blood vessels or body cavities controlled by an external magnetic field. The ViRob can either deliver pharmaceutical payloads or drag a microcatheter through otherwise unnavigable internal territory. ViRob could assist in targeted drug delivery to lung tumors as well as take samples from different areas within the body. 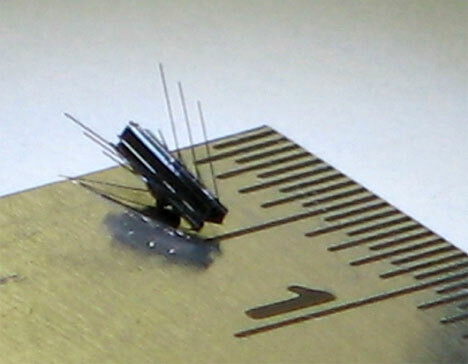 In addition, a number of these micro robots could simultaneously treat a variety of metastases. Researchers also plan to install additional equipment on the robot, including cameras, miniature tongs and other miniature equipment. The robot moves using an external electromagnetic ignition system, stimulated by an electromagnetic field with frequency and volume that do not agitate the body, enabling it to maneuver in different spaces and surfaces within diverse viscous fluids. The vibration created by the magnetic field propels the robot forward, as the tiny arms protruding from a central body grip the vessel wall. A basic prototype of the ViRob, which can move as fast as 9 mm per second, has been developed thusfar. Just another Fantastic Voyage for medical microrobotics.